Cut all fruit and veggie in small bite sized pieces and arrange on platter, drizzle jicima and avocado with lime juice. This recipe calls for honeydew melon and peanuts, I omit because honeydew is not my favorite and I like the freshness of all crunchy veggie. However I leave them as part of the recipe and you can adapt to your own personal taste. Mix orange juice and yogurt until smooth, add the crema, lime juice and lime zest. mix until smooth and chill. 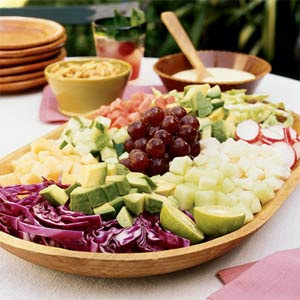 Serve with chopped fruit and veggies.